The patent for Goodyear’s manufacturing technique for India Rubber was granted on May 6, 1851. It is the earliest patent associated with the manufacture of telegraph insulators. This material was used in several different styles including the Farmer & Batchelder Iron Hook and probably in the threadless "hat" styles pictured here. It may also have been used as the insert in the Batchelder patent iron insulators. This patent features a process incorporating sulphur, shellac, magnesia, lime, or carbonate or sulfate of magnesia or lime with rubber which is heated to create a hard and inflexible compound. The three specimens pictured here are all different sizes, have different wire groove configurations, and have two different pinhole diameters and are extremely rare. Some specimens have "Goodyear Patent May 6, 1851" embossed in the wire groove. (Left) This piece on the handmade wooden pin was found in Central Nevada. (Center) This piece with the large diameter pinhole was found in the basement of the Old Sacramento Telegraph Office. 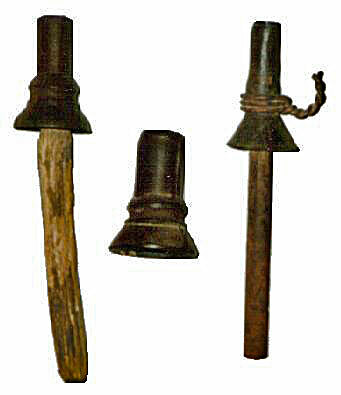 (Right) This piece on the iron pin was found on the Alta Telegraph route near Downieville, CA which dates to 1857.